Yesterday, I received a pleasant surprise in my email. 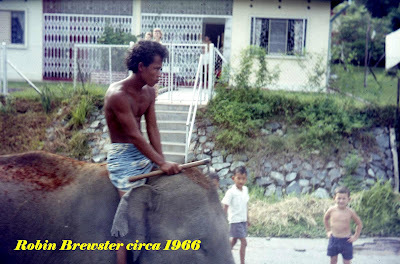 Mr Robin Brewster sent me some 1965/66 photos of Singapore. 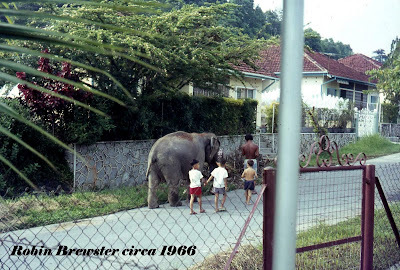 Among them were two that my guest bloggers Freddy Neo and Edward Williams, and other old timers familiar with Sembawang Hills Estate would love – photos of an elephant strolling along Seraya Crescent. According to Robin, the animals (yes, more than one) were being exercised, and it was a fairly regular affair. 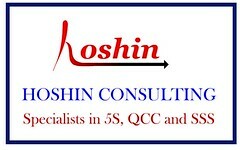 Unfortunately I don’t have any other details to share. Hopefully Edward and Freddy can shed more light on this interesting sight that we are unlikely to ever witness again in 21st century Singapore. Hehee ….. maybe that bare-chested kid in the photos is our friend Freddy? Naa …. in 1966 he would be around 14 already. PS - If you do not know where is Seraya Crescent, please refer to our previous post. Phase 1 of Sembawang Hills Estate is the area bounded by Casuarina Road, Seraya Crescent and Old Upper Thomson Road. 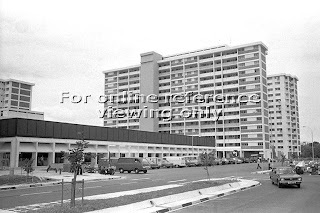 I assumed that this sector was built first before the homes across Thomson Road, which stood on a hill. The latter part of Sembawang Hills Estate where Freddy and I lived is generally known as Phase 2. The Sembawang Baptist Church was situated on the end of Casuarina Road where it met Old Upper Thomson Road. In this two-storey building sermons and hymns were conducted in Mandarin. The cobbler of Jalan Leban was one of the regulars here. I suspected that he only attended the night services, due to his work commitments. Large pieces of white paper hung on a simple wooden stand where the words of hymns were written. The lay preacher used a long stick to guide the congregation along the sheet, as they sung. I cannot remember if musical instruments accompanied the hymns being sung. I have a vague recollection of an organ being played. Lay preachers taught Sunday school in two rooms upstairs. During Christmas Eve, parishioners go carolling in a lorry, visiting many homes in nearby villages and the estate till the early hours of the morning. They returned to the church at about 5 am, were fed a simple hot meal and slept on the floor of the rooms upstairs and on the hall downstairs. It was a lot of fun for the young ones especially, spending the night away from home. The terrace house at the corner of Nemesu Avenue and Old Upper Thomson Road was used as a Presbyterian Church. Sermons and hymns were conducted in English in this church, led by Pastor Heng who sung with a soprano voice. The church had a small organ and I believe a guitar was occasionally used to accompany the hymns being sung. Many of the estate locals attended this church. Services were often conducted at the front of the house, under an extension. The parishioners here were generally younger than those at the Sembawang Baptist Church. Because it wasn’t a “standard” church building, the informal atmosphere in this terrace house was more like a Sunday school which suited the younger crowd here. A row of shop houses were congregated in a strip besides the Sembawang Baptist Church. I can only remember 2 of the shops here – a coffee shop (kopi tiam) and a provision shop. 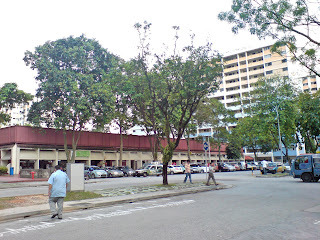 At the back of this row of shops, facing Thomson Road stood a number of hawker stalls. Two of the stalls were operated by the son and daughter of the cobbler of Jalan Leban. Their stalls sold ice ball, ice kachang and tahu goreng. In the Chinese provision shop the usual household goods were retailed but I remember it for another reason. At the back of this shop was a slot machine which my friends and I had many attempts at trying to beat the odds. If you enter by the rear of the shop and asked for the machine the owner would remove the gunny sack which covered it. The back of the shop was the storage area for sacks of dry goods like rice, flour and sugar. It was dimly lit and had a distinct musty smell. The slot machine was, of course, illegal in those days. It cost 10 cents for each pull of the lever. Three reels would be spun and if the pictures were all the same when the reels stopped, then you won. You could win from 30 cents up to 70 cents if you hit the jackpot. It was a great thrill to hear the coins hitting the tray for every win. The 70 cent payoff was rare; most times you won 30 cents and occasionally 50 cents. It took only several minutes before we lost all our money to the machine. The next weekend we’d be back again for another go. We were convinced that there was a way to pull the lever which would deliver the jackpot. We tried everything possible – from slow motion pulling to a fast quick jerk of the handle. Nothing seemed to work. After several weeks we decided that it was a scam! The coffee shop was a typical Chinese kopi tiam of the 50s and 60s with ceiling fans and spittoons under the tables. There was an Indian stall inside which sold curry, rice, roti prata, chapatti and murtabak . The most unforgettable thing about this kopi tiam was its toilet. Only once did I attempt to use it but when I pushed the door opened, what I saw was simply too revolting to describe. So I‘ll spare you the details. There was no lighting and the stench was so overpowering. This toilet was the worst I’ve ever seen; one quick glance was enough to eliminate any pressing reason for you to be there. I took this photo of an old coffee shop in Kelapa Sawit, Kulai, recently. 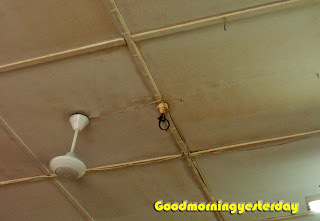 The ceiling and ceiling fan that Edward mentioned above must have looked like this – Chun See. The owner of the coffee shop was a Chinese man who wore a singlet, pyjama shorts and slippers. He had huge lumps on his shoulders and back which looked like benign tumours. He was obviously not concerned about the effect of its appearance on his customers. One day my friend and I dropped into this kopi tiam for a cold drink after a jog along Old Upper Thomson Road. The kopi tiam owner chipped a block of ice on a container with an ice pick and then plunged his bare hands into the container, scooped up some ice and filled two glasses with it. Soft drinks were poured into each glass. The cooled drinks tasted most refreshing, and we silently hoped that his hands were clean. As we were enjoying our drinks and conversation, he stood in front of us, 2 tables away, leaning against the counter and … to our horror he slipped his hand under his pyjama shorts, and casually scratched his scrotum, seemingly oblivious to those around him. My friend and I looked at each other and a thousand thoughts must’ve flashed across our minds. Thoughts like “will we survive this episode?”, “what deadly diseases will we be afflicted with in the next 24 hours?” etc. This old chap obviously wasn’t concerned about personal grooming or habits, or its impact on his customers. Of course what he did was socially unacceptable because it was done in public, rather than in the privacy of one’s home. We made a note that in future we would order our drinks without ice or glass. Just drink it straight from the bottle with a straw. Clearly the standards of hygiene at this coffee shop were appalling. The revolting toilet was used by the coffee shop staff as well as the Indians who operated the curry corner. This scenario was quite typical of the 50s and 60s – unclean toilets (an understatement) coupled with unhygienic practices (personal habits and food handling). Many hawkers were just as guilty, especially where the washing of their dishes and cutleries were concerned. A basin of water could sometimes be used for a long time, until the colour of the water turned greyish with remnants of food floating about. This usually occurred when the hawker does not have easy access to clean water. Of course the advent of the food centre brought about vast improvements in food hygiene. Food handling practices improved from the late 60s on, mainly in response to the government’s initiatives. Today all food handlers have legislative obligations to fulfil, such as typhoid inoculation, chest X-ray and a basic food hygiene course which includes personal hygiene and grooming, cleaning and sanitation. This is a giant leap forward, and no longer should we fear the ghastly toilets or being served by staff with poor personal habits. Below are 2 photos of the same place taken 31 years apart. Can you identify this place? The top photo is from the National Archives website taken in 1978. When I look at these two photos, the opening lines of an old song come to mind. Can you identify this song? But friend it hasn’t been too long it wasn’t big. I had breakfast there this morning and chatted with the tau-huay vendor. She told me that this entire area will be demolished after Chinese New Year. No wonder most of the shops, food stalls and wet market stalls were empty. So if like me, you have some sentimental feelings for this place, you should make plans to come down and take some photos before it is gone. I plan to do that as I did not have my camera with me. I took the above photo using my mobile phone. In 1962, Singapore and Southern Johore suffered a severe drought. Rain did not fall for months. At that time, Singapore had only three open reservoirs. MacRitchie was the biggest and Seletar (now upper Seletar) was the smallest. Peirce Reservoir (now Lower Peirce) was the third reservoir. I grew up in a house near to the Peirce Reservoir. I often went to the reservoir with my father and siblings during weekends to walk or fish and we could see the dwindling water stock. The shoreline was receding. With each passing day, the shoreline was further and further away. All around, the dry bed was baked solid dry and cracking. Peirce Reservoir was created from the damming of the Kallang River. It was completed in 1909. My maternal grandfather had a hand in its construction. He was a bullock cart driver who was engaged to transport granite blocks to the construction site. I suppose he would be today's equivalent of a lorry driver. Before it was built, there were villages on the banks of the river. The 1962 drought revealed some house sites. They were easily identifiable from the house foundations and relics of human habitation. In one of our walks we picked up a clay water pitcher that was in fairly good condition. Unfortunately, my little brother who was then about 6 years old, dropped it while carrying it home and it broke into many pieces. When the situation became critical, water rationing was introduced. There was water from the tap only for a few hours a day. If I remember correctly, water supply was turned off from 8.00 am to 8.00 pm. Before the tap ran dry, we collected as much water as we could. Every pail, basin, pot and earthen jar was used as a receptacle to store water for the day. We would use the water in these containers for cooking or washing utensils only. For our daily showers, we have to wait until the water supply was restored in the evening. For some of us boys who did not want to wait until evening, we proceeded to a natural spring outside the Peirce Reservoir for our bath. I remember that there was water flowing even at the height of the drought. As the drought continued, I remember that there was talk of cloud seeding. I don't know if this was eventually carried out. To store even more water, my father went to buy an enormous oil drum. At the end of the day, my family used more water in spite of the rationing. If my family was typical, then water rationing did not really work. Perhaps it didn't rain that year from about March or April and lasted to September or October. Water rationing only ceased when the year end monsoon came and filled up our reservoirs and the Tebrau River in Southern Johore. Did you hear the good news? 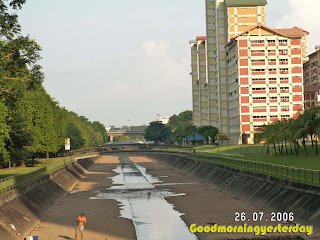 Our government plans to re-create the Kallang River that used to flow through my kampong. I am talking about the river that I blogged about a few times (see links below) and which helped me to bag a $100 Harvey Norman voucher. This river used to meander through our kampong from around Braddell Road to Upper Thomson Road so much so that Lorong Kinchir traversed it 9 times. That’s why the kampong folks referred to Lorong Kinchir as Kow Tiao Kio in Hokkien. Now it is just a straight (boring) concrete canal running from Thomson Road to Braddell Road. They are going to pump in $76m to turn the present concrete canal into a meandering waterway. I don’t think the National Parks Board has the interest of the oldies in mind when they embarked on this project. But I trust that the National Heritage Board would do the right thing and contribute some dead chickens when this river is completed to make it a truly nostalgic experience for the older Singaporeans like us. 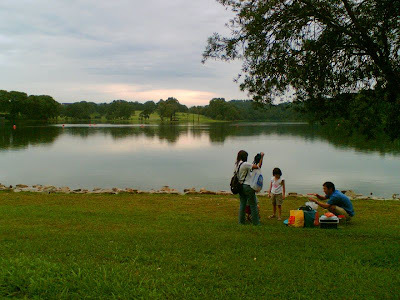 When we were young our parents brought us to Pierce Reservoir as an afternoon or evening outing. Sometimes our dog would come along too. It was good for the kids to run around the lawn where rows of canna plants stood. The canna plants were grown in “plots” with each having a colour of its own. It was such a pretty sight to behold. There were many varieties of trees at the reservoir, but the one that we liked best was the Frangipani. We picked the sweet smelling Frangipani flowers and made letters and words with them on the lawn. Although there are several colours of Frangipani flowers, we only saw the white ones. The fragrance of the flowers permeated the lawn where we played hide and seek, using the plots of canna plants as a shield. Walking along the water’s edge, stopping to peer into the clear water for signs of little fishes … these were the simple things that were a treat for us. Sometimes we sat by the water’s edge, ate dry plums, and threw the seeds into the water, just to watch the ripple effect on the surface. I have seen people fishing at the front of the reservoir. I gather that they had a license for that. In later years I believed fishing in the reservoir was disallowed. We walked to the front end of the reservoir towards the part where huge pipes stood. These pipes seemed to come out of the ground and spanned across a man-made channel about 25 to 30 yards wide. Most times the channel was empty but I assumed that they will be filled with water during a heavy rainfall. To a little child, these pipes were massive structure that must have carried huge amounts of water from the reservoir to another place. The older kids and adults were able to walk on these huge pipes across the channel to the other side. As we grew older our parents no longer took us to the reservoir. We went there with our friends in the neighbourhood. We’d fish there, which was illegal in those days. Twice we were chased by the forest ranger. We don’t know if forest rangers were employed in the 60s but he certainly looked like one – dressed in khaki shorts and a matching shirt with a topi hat. Well that was official enough for us, and we ran for our dear lives! He could be one of the locals jealously guarding the reservoir out of a sense of civic duty. Later on we found another route to the interior of the reservoir, from Old Upper Thomson Road, close to 8 mile stone. This part of the reservoir was more secluded, away from the prying eyes of the public front entrance. Besides fishing we climbed the trees and fantasised ourselves as Tarzan. I was a scrawny kid then but it did not stop me from thumping my chest with my fists and calling out like Tarzan in the movies. Of course no wild animals heeded my calls and I was left to fend off the bad guys on my own. There are many fruit trees in the forest reserve. In one of my hikes, we saw several tall buah duku trees. It was by chance that we spotted remnants of the fruits on the ground, probably discarded by monkeys after they have eaten it. Once we picked chempedak fruits which we thought were almost ripe. At home I wrapped the fruits with old newspapers and put them in a cupboard. Two weeks later the smell of the fruits became evident as they ripened. However I was disappointed to discover that the fruits were not as tasty as I had hoped for. In the 60s you don’t see many monkeys in the forest reserve, especially at the front entrance of the reservoir. If you ventured deeper into the forest you may get an occasional view of monkeys. I once spotted what appeared to be a wild boar, from a distance. I think they were virtually extinct by then. A friend of mine has seen an anteater, another animal thought to be extinct. This photo of a monkey helping itself to the rambutans was taken by Chun See at MacRitchie Reservoir. Spiders were the creatures that I dreaded most. I am talking about big, colourful spiders, ugly as anything, sitting on a web about 3 feet wide (91.5 cm). Twice I almost ran into the web during my cross-country run. Hornets were one of the deadliest creatures in the forest. I have read of 2 cases involving fatalities from hornet stings. Both incidences happened in hiking groups in the reservoir but I cannot recall if it was MacRitchie or Pierce (or both). 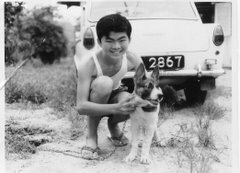 I think Seletar was not a common hiking ground in the 60s. Fortunately I have never encountered any hornet nests in the years I spent in Pierce Reservoir. As for scorpions, a little one somehow got into my haversack and hitched a ride home with me. I was fortunate not to be stung by this creature. The biggest scorpion I found was a dead one, along Old Upper Thomson Road, after a night of heavy downpour. It measured 4 inches (10 cm) in body length, but if you include its tail it’d be 9 to 10 inches long (25.4 cm). The sac at the end of its tail was about half the size of my last finger tip. We were on a hike when our group saw this black scorpion lying on the grass strip along Old Upper Thomson Road. I was told that if you were stung by a scorpion this size you have about a minute to live. My brother and I and a couple of friends camped in the forest reserve on two occasions. In those days we had no ready-made tent or camping equipment. Our tents were simply large canvas sheets made water proof by covering it with hot wax and drying the sheets under the sun. To pitch a tent, we tied a rope between two trees and placed the waxed canvas sheet over it. For cooking we used a small aluminium stove about 5 inches (12.7 cm) square, which stood about 2½ inches (6.4 cm) above the ground. White solid fuel was used for burning. Mostly we ate canned food since there was no game to hunt and the fishes weren’t plentiful enough or were simply too smart to take our bait. We also built open fires and threw potatoes onto the embers for supper at night. Once we hiked the entire perimeter of the reservoir, along the water’s edge. It was a tough 8-hour hike for a young teenager. Sometimes we had to cross over the water because the tracks became inaccessible. We received many cuts from the reeds in the water which had sharp edges, like the lalang grass. At the end of the long hike, when we reached the Island Club golf course, we congratulated ourselves heartily for completing the mission. Pierce was very much undeveloped in the 60s. It was essentially a forest reserve in its “raw untamed state”. There were no developed tracks for running or cycling, exercises or trekking. Except for the front entrance, no one but the adventurous ventured into the interior. Before the construction of the new Upper Pierce reservoir, it was simply know as Pierce Reservoir (now renamed Lower Pierce Reservoir). It was this old Pierce reservoir that was the playground of my childhood days. As Freddy said, Pierce Reservoir was a place where you “roughed it out”. Only men and boys do that in those days. I grew up in a house near to the Pierce Reservoir (now called Lower Pierce Reservoir). I attended Sembawang Hills Estate Primary School until 1964. 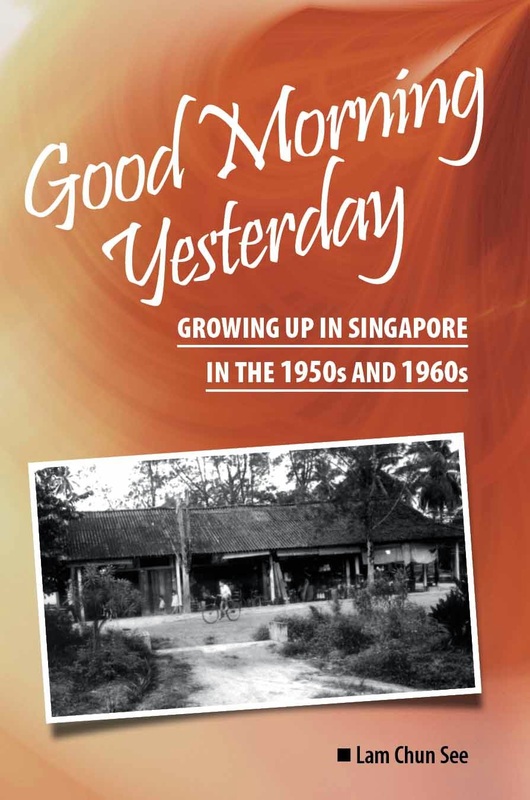 The school was along Old Upper Thomson Road near to Sembawang Hills Circus. It was at the edge of the forest reserve. Pierce Reservoir and the forest reserve were our playgrounds. We went fishing in the Pierce Reservoir and caught various species of tropical fish and fresh water crabs in the forest streams. When I was in primary six, I was in the afternoon session. The afternoon session was from 1.00 pm but at one stage, we would go to school early so that we could go crabbing or fishing before school. Even on examination days, we still went. On one of the days, I remember we boys were late for the English test and our teacher, Mr. Vasegar (he is now in his 70s) was waiting for us at the entrance to the classroom. He was fuming. He lined us, came around and gave each of us a tight slap. Only then were we allowed to go into the classroom to take our test. In those days, teachers could issue corporal punishment on the spot and none of us would complain. Anyway, if we did tell our parents, we will probably have gotten another beating at home for being naughty. But Mr. Vasegar could also be quite kind hearted and understanding. There was one afternoon when we were trying to hide our haul of barbs in a powder milk tin container under my desk. In the midst of his maths lesson, he saw the container. This time instead of getting punished, we were allowed to keep the fishes in the classroom. Not only that, he berated us for being so cruel as to put the fishes in such a small container and ordered me to get a big pail from the school janitor to put the fishes. He joined in as we transferred the fishes from the milk tin to the pail. Usually, I got to keep our haul of crabs or fish because none of my classmates wanted them. One of them, who was my closest friend, was an expert in digging the crab holes to catch the crabs but would not bring any home. He told me that his mother will cane him if she found out that he had gone crabbing in the forest. By the way, the crabs were about the size of a 50 cent coin and I put all of them in my fish tank at home. Away from the pristine water of the jungle stream, none of them survived more than a few days. But fishing in the reservoir was our favourite pastime. We used home-made rods or just lines. Our baits were big fat earthworms which we dug at the forest edge. Not to be caught by the rangers, we had to go really deep into the forest. We walked to the opposite bank of the reservoir, away from the park area. There we will be sheltered by the thick foliage and the rangers patrolling in their boat will not be able to see us. When we saw them approaching or coming close in their boat, we will lie low and wait for them to pass before resuming. Anyway, the rangers in those days were quite lenient to us children. Even when they saw us, all they did was to tell us to stop and go home, often leaving us intact with our catch and our equipment. In those days, the reservoir was teeming with fishes. In one afternoon (3 hours of fishing), each of us could catch about 5 to10 fishes. The fishes were mainly tilapias, red eye barbs which the Hokkiens call "ang bak Jit" and a sharp jaw, long and slender fish of about a foot long (don't know the name, in Hokkien it is just "chiam chwee Hee"). When we took the fishes home, we normally fried them or cooked them in sambal. But they were not nice to eat. I remember them as being quite fishy. I suppose the fun was in the fishing not the eating. Some hot afternoons, we even went skinny dipping in the water. Being keen aquarists, my elder brother (3 years older) and I liked to catch ornamental fishes in the forest streams or remote forest ponds in the hope of catching some yet-to-be discovered species. He will ride his bicycle and I will ride on the cross bar carrying the punyi as we traveled from our home to the forest. We knew all the streams and ponds at the back of our hands. We knew the pond in the forest near to the water pipe, directly from Devil's Bend junction, will yield us the six zone tiger barbs and the stream where we will catch the two spot rasboras and the clown barbs. We worked as a pair. My brother will go into the water with the punyi and I will be the spotter on the bank telling him where the fishes were for him to scoop up. We were quite familiar with the popular species because we had read them up in the encyclopaedia of tropical fishes. One day we managed to catch a fish (a barb species) not found in the encyclopaedia which we promptly christened as the Neoson barb. Many years later we saw this species for sale in the aquarium shop and it was labeled as the Golden Barb. But to me, that species shall always be Neoson barb. My elder brother passed away in an accident in 1978. The Mid-Autumn Festival is here again! Chinese Singaporeans, together with ethnic Chinese all over the world, will celebrate this traditional festival on October 3 this year ( Lunar calendar 八月初八日). It is also commonly known as the “Mooncake Festival” or “Lantern Festival” in Singapore. 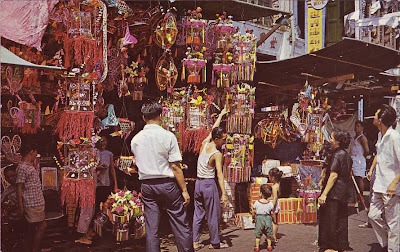 Traveling back in time in my mind now, I remember celebrating the mid-autumn festival with my childhood friends in the kampong of Bukit Ho Swee when I was a 9-year-old boy, 53 years ago. At that time, I was staying at 10C, Beo Lane, Singapore before the “Bukit Ho Swee Fire”. As night fell and the bright full moon took over the sun in the sky, about 12 of my buddies and I assembled at the spacious courtyard of the landlord’s house. The landlord’s grandson was the leader. Each of us carried a paper lantern of different color, shapes and designs. We were happy and looking forward to an enjoyable evening of fun, carrying our lighted lanterns and walking around the kampong in a procession. Some were chaperoned by their parents. Each lantern has a small, lighted candle. It was a happy celebration for children in the usually quiet kampong at night. Old photo of roadside stall selling lanterns. Photo courtesy of Derek Tait from page 42 of his book, Sampans, Banyans and Rambutans. On the night of September 17, 1959 after dinner, my mother brought out my favorite paper lantern. The lantern was wrapped in brown paper and kept in an olden wooden chest box (brought to Singapore from China by my father). I waited patiently as my mother unwrapped the foldable lantern and handed it to me. Every year for the past five years, she had repeated the same ritual on the night of 中秋節. She would store the lantern for me after playtime was over. The lantern must have cost quite a sum in those days. As I write this, I am filled with warm thoughts and fond memories of my mother’s love, the virtues of her thriftiness at a time when people do not have wasteful habits of throwing away stuff which could still be re-used. I did not know that it would be the last time that I would be playing with my beloved lantern that night. 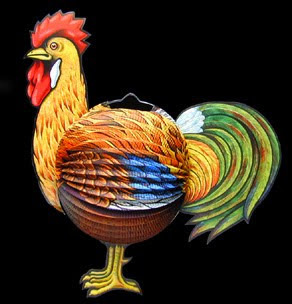 It was a special hand-made, colorful and beautiful lantern in the shape of a rooster. The paper and cloth material and the thin wire-frame of the lantern was sturdy and durable. That is the reason the lantern could be re-used over the years and it was still in pretty good condition. So why did a joyful event ended up as a disaster, a “kill-joy” for a child of 9? 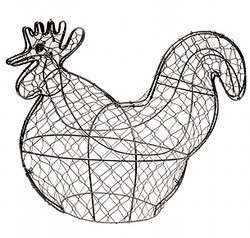 That night, my precious rooster lantern went up in flame within minutes …. burnt to ashes except for the metal frame and the metal candle holder. A group of young “terrorists” (neighborhood children who are slightly older than me) were out that night looking for some fun. Their victims were the young children carrying lanterns in the procession. For want of a better word, I use the term “terrorist”. Actually they were only mischievous boys who were “street bullies” acting tough. They were out to terrorise other kampung kids who were not as tough and younger than them. The “mid autumn festival” coincides with the “buah duku” season, when the fruit was in abundance and sold cheaply at most local fruit stalls. These “terrorists” use the thrown away rind of the “buah duku” as “bullets”. With a rubber band shooter or lastic, a small piece of the rind folded in half was used like an arrow (rind) and a bow (rubber-band shooter or lastic) to shoot at the lighted lanterns. On impact, the lantern would catch fire and destroyed. The “buah duku bullet” was a lethal weapon indeed! While the children were romping merrily near the tomb of the landlord’s ancestor where we used to play, carrying lighted lanterns and singing kids songs, these “terrorist” (4 or 5 of them) appeared suddenly from nowhere and started shooting the lighted lanterns with the “buah duku” rinds within close range. They were a group of sadistic kids who seems to enjoy watching the lanterns set on fire, while the children were screaming and howling. The “terrorists” then escaped into the darkness as mysteriously as they had appeared, and nobody knew who they were. It was a sad night for the “victims” and their parents. However, a few of the better-off parents immediately went to the shops to buy their children a new lantern. My mother looked at me sadly when I returned home empty-handed, without the lantern. I was sad too, and felt sorry for not taking care of the 5-year-old lantern. My mother did not scold or scream at me though. I understood her feelings and told her that I would stop carrying lantern on 中秋節 after that fateful night. I did not want her to buy me another lantern, comforting her with the excuse that I was too old to be carrying lanterns at age ten the following year. I already knew how to be “paiseh” at that age : ) I really missed the rooster lantern. It would have been a collector’s item. While sharing this amusing story with my friend, Ng Eng Tee, I learnt that when he was young, he carried home-made “armoured” lanterns which his brother made for him, using condensed milk tins. He was then staying in the Ulu Pandan kampong (now a high-class residential area at Queen Astrid Park). Eng Tee drew me a sketch of the “condensed milk tin lantern”. The picture here (created by my son Liwei who is putting his professional Photoshop skills to good use) is self-explanatory. The “condensed milk tin” is definitely “terrorist-proof” and would not have suffered the same fate as my rooster paper lantern when shot with the “buah duku rind bullet”. 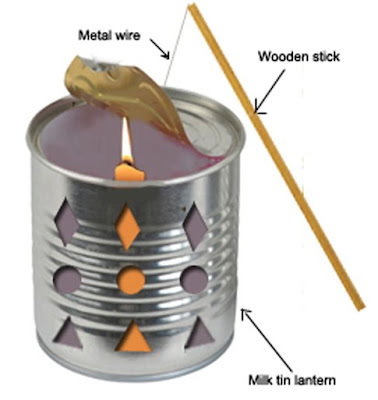 Indeed, “necessity is the mother of invention”, and the creatively designed “condensed milk tin” lantern was made at almost zero cost, except for the price of the candle. According to Eng Tee, he had as much fun on中秋節 as any other children who were carrying lanterns bought off the shelf. There were no “terrorist kids” to burn down their “armoured lanterns”. Wishing everyone a “Happy Mid-Autumn Festival”.